Introducing the all new J-Proz series "J-Bug" designed by 2 time Bassmaster Elite Champion Jacob Powroznik. Designed specifically for flipping and pitching to isolated and heavy cover with pinpoint accuracy. Its slim body design allows it to penetrate heavy cover while falling straight to assure it falls as close to the target as possible. Added appendages and ribs ensure lifelike action that the fish just can't resist. It works great when rigged with an Elite Tungsten weigh and a 3/0 Mustad Flipping hook. 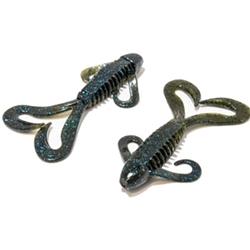 It can also be used as a jig trailer and works excellent on a Carolina Rig. Try the new J-Bug today! It's a "REALLY REALLY" good bait!